Can’t wait for the Easter egg hunt? Our printable board games page has the solution ! 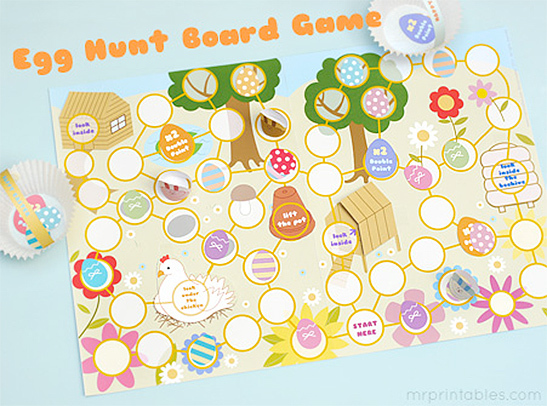 : ) A lovely simple board game that will excite children towards Easter, perfect during the Easter holidays if you can’t get enough of egg hunting fun, or really at any time of the year. (It’s chocolate free!) This game has one simple goal – collect as many eggs as you can! Kids will love collecting eggs in their baskets and lifting the flaps to find the hidden ones. Good luck hunting! The game involves counting numbers, remembering hidden objects and strategy in deciding where to hunt / which direction to go in. The goal is to collect as many eggs as possible in your basket. One person who isn’t playing the game hides the eggs. Place the eggs on any circles you want. You can place multiple eggs in one place. Also hide the eggs inside the shed, chicken coop, under the chicken and in the beehive. You can cover eggs on the circles with teracotta pots. Place the eggs visibly on many circles for smaller kids so it’s very obvious for them. Hide multiple eggs under each hiding place for older kids to make the game trickier! Connect pages 1 and 2. Mounting them on to sturdy board is a good idea for durability. Cut out all the shapes and eggs. Make your bunnies & your baskets using cupcake wrappers and the strip handles. Glue the shapes 1 to 4 with the tabs to the board to complete the hiding place flaps. Take one basket each for collecting eggs. Start from the ‘Start here’ spot. Throw a dice and go anywhere you want. If you land on a spot where the eggs are, you can collect one. You can only collect one egg at a time if there are multiple eggs. When you land on the places where the eggs are hidden, lift the flap to find them! Take one at a time, close the flap and leave the rest for next person. Keep going around, collecting eggs until they are all gone. You can move in any direction (back and forth) along the connected circles. When you think it’s all finished, count the eggs. The person who’s got the most eggs in his/her basket wins! Feel free to print extra eggs, decorate your own or make your own special rules! We hope you have great fun with our Easter game. 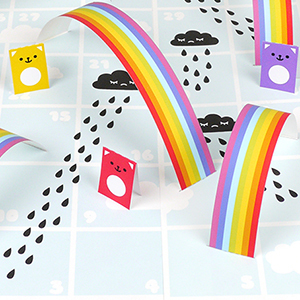 We’re working on new printable board games which we’ll share with you all soon!